IndeflataBall full game found and released! Sorry for the lack of updates recently everyone – i’ve been really swamped on another project recently, but we have been preparing for our annual Christmas update, where we have a few bits and pieces for you as well as a digest of updates that have been happening in the background. 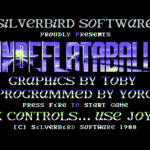 As an early Christmas present, we thought we’d share a recently recovered full version of Silverbird’s IndeflataBall with you, thanks to Cory Kin finding a last batch of disks which contained the final edition. Next update will be the Christmas update itself with some more unreleased games and previews, along with some recovered CNET demos which may not have been preserved yet.